Placed first with the DMR at the Vanderbilt Invitational … Ran a season-best of 2:11.18 in the 800 at the Razorback Invitational … Helped the Hogs pick up eight points off a second-place finish in the DMR at the SEC Indoor Championships … Raced to a lifetime best of 4:29.81 in the 1,500 during the outdoor season at the Bryan Clay Invitational … Closed out the season with a top-20 finish in the 800 at the SEC Outdoor Championships. 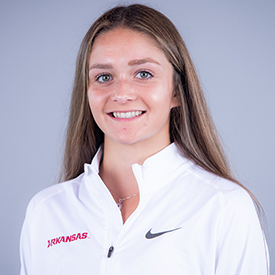 Started her tenure as a Razorback with two-consecutive top-two finishes in the 800 at the Arkansas Invitational (1/15) and Gladstein Invitational (1/23) … Placed sixth in her signature event at the Razorback Invitational (1/30) … Ran a personal best performance in the 800 at the Arkansas Qualifier (2/19), crossing the finish line in 2:08.04 as the runner-up … Placed 16th at her first SEC Indoor Championship (2/27) … Kicked off the outdoor season with a top-eight performance at the Arkansas Spring Invitational (3/26) … Recorded a season’s best of 2:11.03 at the Texas Invitational (4/16) to place 11th. Three-time 800-meter national champion … Three-time OFSAA 800-meter champion … Two-time OFSAA 400-meter medalist … Holds two OFSAA 800-meter records … 800-meter runner-up at 2013 New Balance Nationals. Born on May 22, 1997 … Daughter of Tom and Deb Sawyer … Has one brother, Kyle … Majoring in kinesiology … Hopes to medal at NCAAs, represent Canada at the 2016 World Junior Championships and long-term represent Canada at the Olympics.